Credit: Satellite data courtesy of NASA Worldview. If you could hover far above the southeast Atlantic Ocean, particularly during the months of April through June, on many days you will likely witness a sharp line of clearing moving east-to-west and eroding large regions of low cloud typically present over the region. "Low clouds are important because they help cool the climate," said David Mechem, University of Kansas associate professor of geography and atmospheric science and one of the paper's authors. "These are huge sheets of white clouds that reflect sunlight back to space. When we try to do climate predictions for 50 years in the future, it's important to get these clouds right." "This is what we stumbled into — dramatic clearing events," Mechem said. "We fixated on this because of its potential importance for climate models to represent this feature." "What we think is going on is that the air flow from land to ocean overnight is triggering atmospheric waves that then move west," he said. The wind flow offshore off the southwest African coast is a common weather phenomenon Floridians or anyone who has visited the Sunshine State's coasts knows, Mechem said. During the day, the land heats faster than the ocean, causing a breeze blowing off the ocean toward land. At night, the land cools, and the wind blows back toward the ocean. Mechem and his colleagues describe the wave movement as what it's like to be floating on a raft in the ocean far away from the shore, where you're bobbing up and down as the waves roll by. 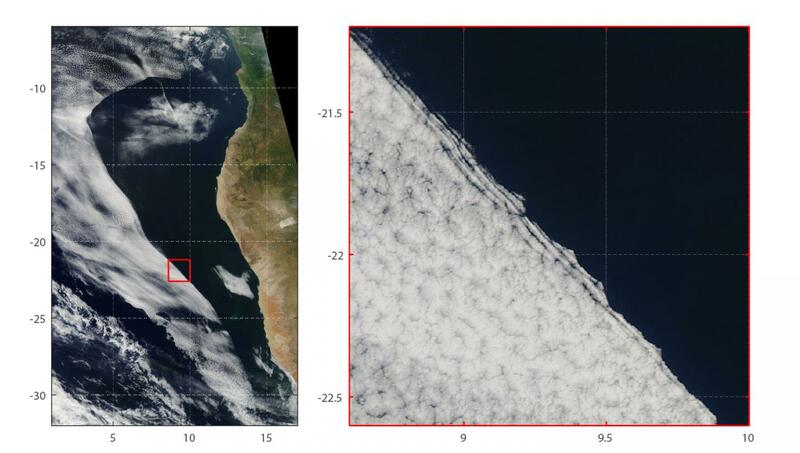 "Air comes off the continent, interacts with the air over the ocean, and excites these waves, which move through the cloud field, promoting mixing and enhanced cloud evaporation," he said. "We have to know how they will respond to a warming climate," he said. "Will you have more or fewer? This itself is just a natural event, but we'll be trying to go back and see if there's any trend in the number of these events."